When Glenda needed new glasses, in part inspired by an article in The International Routier (back in its Dead-TreeWare days), we thought it would be fun to see if we could make a pair of leather framed spectacles using the old lenses. We enlisted the optician in the project, getting him to turn the lenses as small as he could make them on his equipment. They came to me marked “left” and “right” with a prominent arrow indicating the direction of “up”. They’re still probably 120-130% the size of the originals. The lenses are sandwiched between two layers of 1.6mm cow hide, with the nose bridge reinforced with hidden bronze wire. The construction method is an approximation at best. I know lenses were held in the horn and bone framed glasses with a spring made from copper-alloy wire but haven’t been able to see a leather framed pair closely enough to work it out. There are a sewn pair similar to this from 16th century Italy, but the stitching may be decorative rather than structural. Our leather framed spectacles, the pattern with the ties is slightly later than the 15th C pair above. The tie is fingerloop braided, the other option would be a silk ribbon but modern silk ribbons aren’t as strong as 17th C ribbon due to the thickness and weave. Many 17th century portraits show people with their hands clasped together with a ribbon coming out from between them. This may be a spectacle tie. Glenda’s worn them a few times, apart from the problems with fogging because the lenses are so close to the face, they frighten the punters at public shows. Not just second glances, we’re talking about grown adults grabbing the kids and pulling them away and screaming. We were just expecting Biggles comments. If you make a pair, keep them for private events. Leather spectacles may have been a cause of some friction between the guilds, spectacle makers must have sourced leather from the Leather Sellers Guild, no doubt being blamed for forcing the prices of hides up by the various competing leather guilds.”The SMC [Spectacle Makers’ Company] particularly disapproved of leather frames, a forcibly held position that might explain the growth in popularity among the makers for using horn. 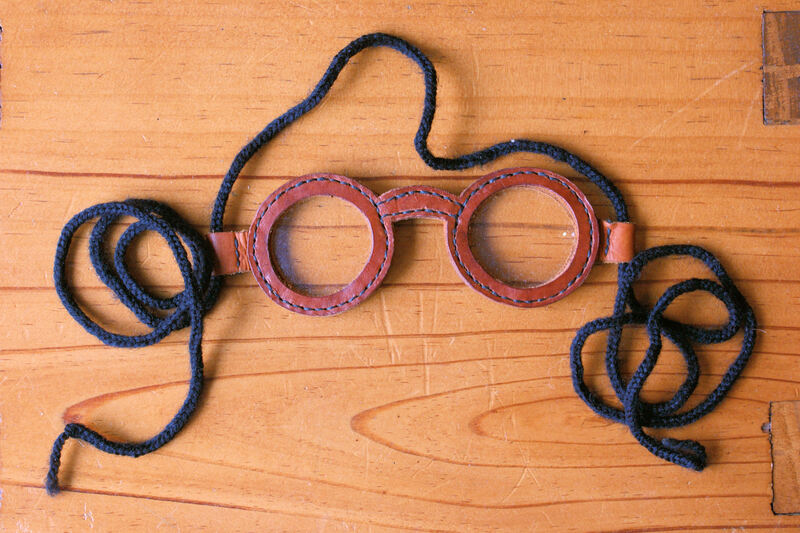 Leather frames were seized from the noted optician John Yarwell by the Company’s inspection team in 1692.” The College of Optometrists, London, Gallery > Seventeenth Century Spectacles. This post is a warning for young players, going back in time to somewhere in the youth of the Internet. Back in those days, a fast connection was a dial-up connection with a 14.4kbps modem, a big website was anything over 1MB, and 800 x 600 in 256 colours was high resolution. The excellent series of YAT publications weren’t widely known here and and the publications that were available were more of the glossy coffee-table types. Online catalogues and web sales were years away and photos were only used on the most data-intensive sites. The images we had access to in the Antipodes were not of the finest quality, and lead to errors such as this. I’d been given a combat-grade saex with a forged iron blade, leather bound scale tang hilt (the scales were two thickish slices of a branch with the bark still attached) with held together with rough steel rivets. The point was 10mm in diameter and the “edge” was 3mm thick. It had seen some use in combat and was rough, ugly and I couldn’t get my hand all the way around the hilt, but you don’t look a forged blade in the mouth. It didn’t take me long to reshape the point and file and grind an edge, and there was enough meat on the tang for me to be able to turn it into a whittle tang. I made the hilt from a carved lamb bone from a roast we had, with 3mm brass plates at each end. The tang passes through the backplate and is peened over. The buckles are made from the same lamb leg as the hilt, using opposite sides of the lower end of the femur near the joint. I then needed to make the scabbard. Saex scabbard, loosely based on one from Jorvik. The original has much coarser knotwork but still shows paint in the same colours. I knew of an illustration on the Regia Anglorum website and spent a ridiculious amount of time trying to work out the knotwork design. I relied heavily on contemporary manuscript knotwork, and drew the techniques from the MoL Knives and Scabbards book. I got it wrong. This is the original illustration I was working from. If anything, I've been able to clean it up a bit. 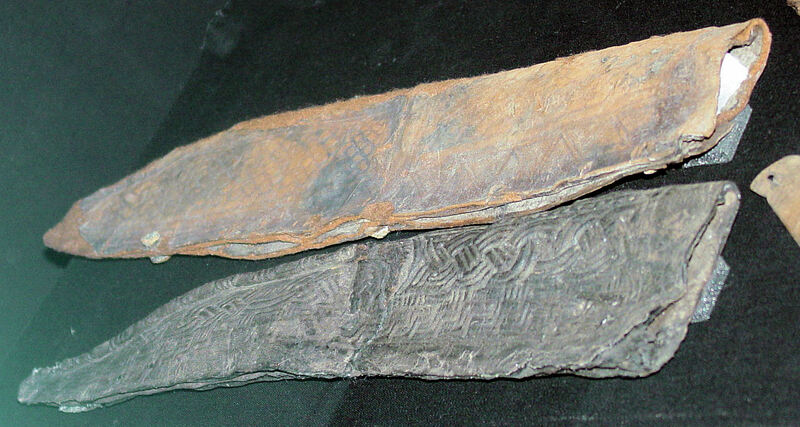 Two saex scabbards at Jorvik. 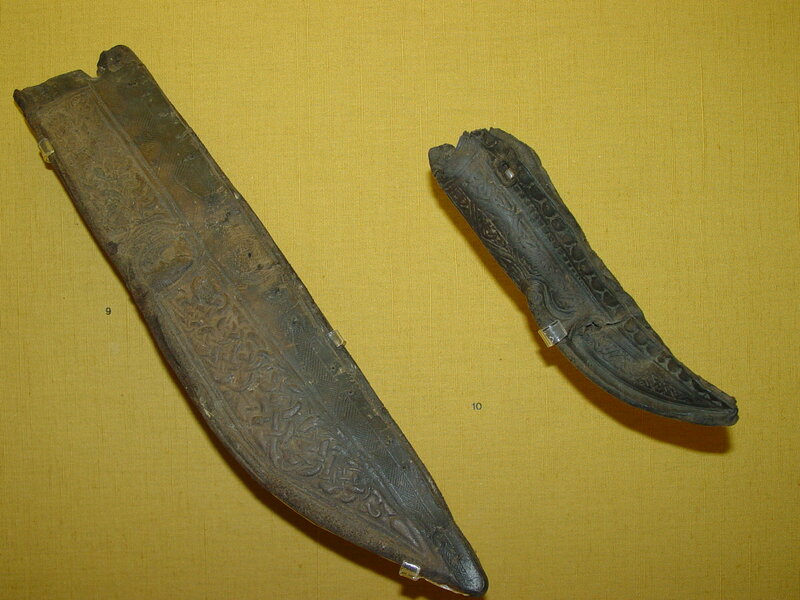 The upper one shows similar punch work to this one from the Yorkshire Museum up the road. The one on the right is discussed in another post. The one on the left is the one I attempted here. 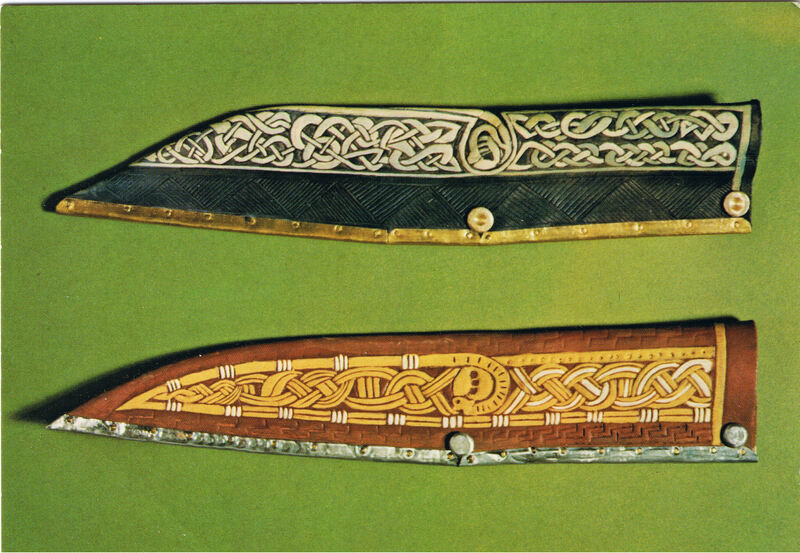 I’m happy with the stamped decoration along the edge of the blade, but the knotwork is completely wrong and the execution is 11th-13th century. I’ll have to remake it one day, but I need to work out if I have to shorten the blade first. The York postcard below shows someone else’s interpretation of a couple of scabbard, they have their own problems but aren’t bad. 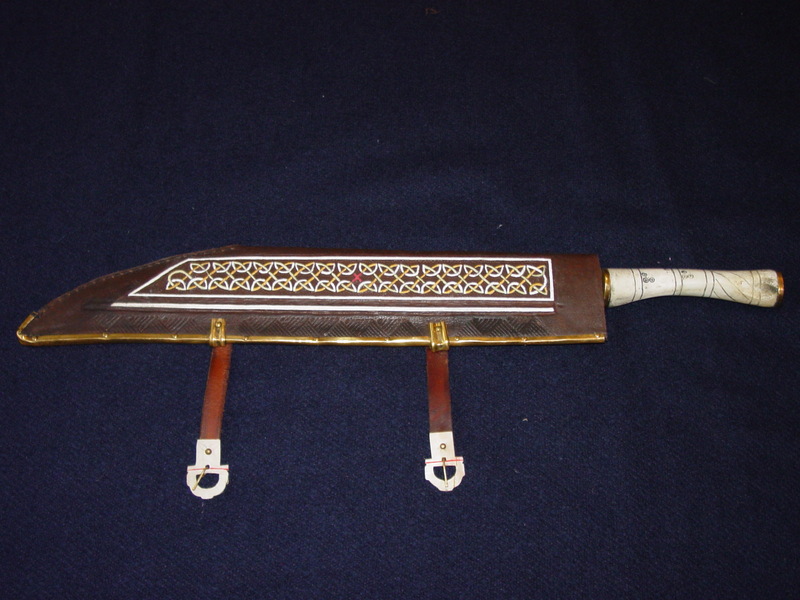 Postcard: Replica leather knife sheath from The Jorvik Viking Centre. I suppose the moral of the story is to make sure your references are clear before you begin anything. Regia Anglorum, http://www.regia.org/, accessed 26 April 2006. If you were following the Costrels thread, you probably saw Jeff’s comment down the page. 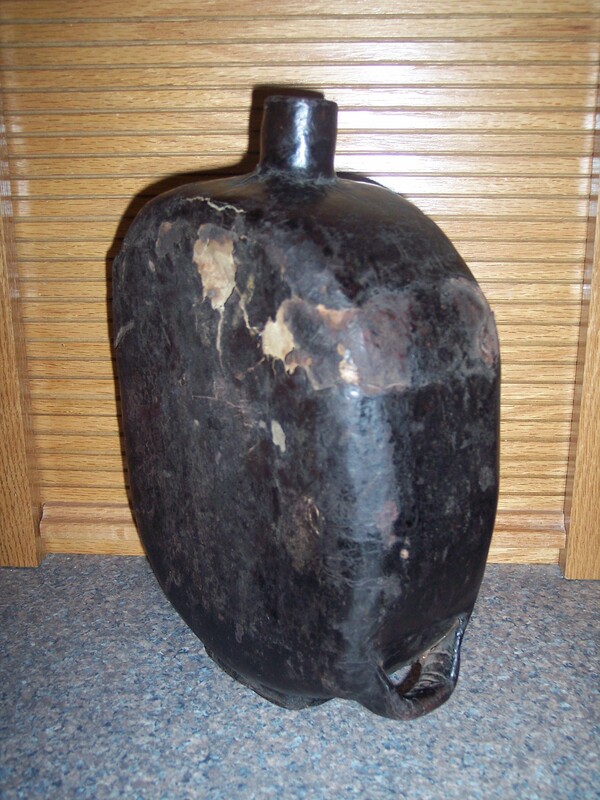 Following some correspondence, Jeff to sent me these photos of his leather bottle. 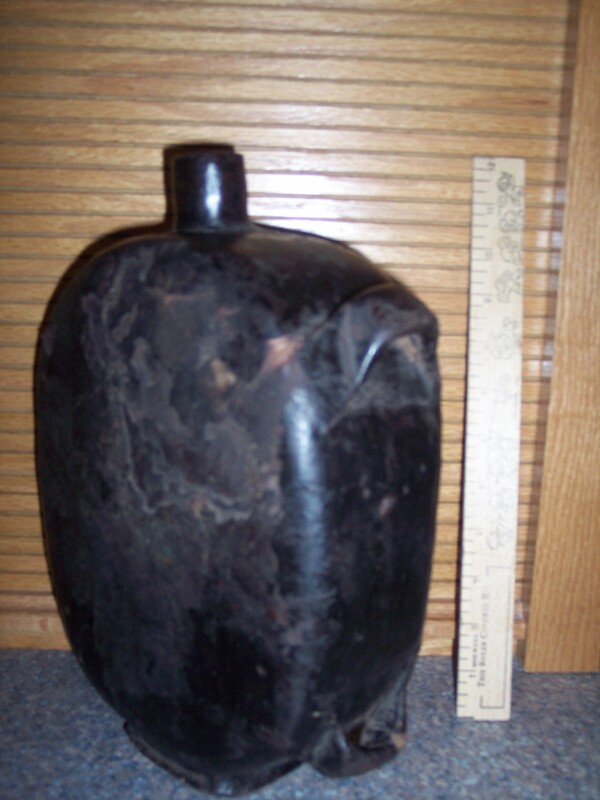 At a really rough estimate, the volume is 2.5L/0.5 gallon. I’m making stuff up here, but by the way the loops are done, the work appears to be that of a saddler, I have no idea to the origin or age of the item. Does anybody else have any information? We’re looking for something a bit firmer than my supposition. Thanks to Jeff Steere for his kind permission to publish his photos here. 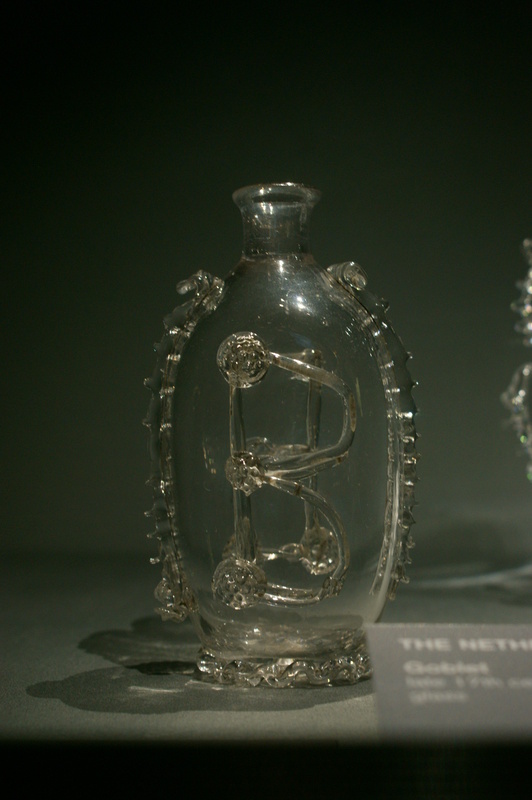 I saw this glass example in the National Gallery of Victoria recently and was struck by the similarity in the shape. 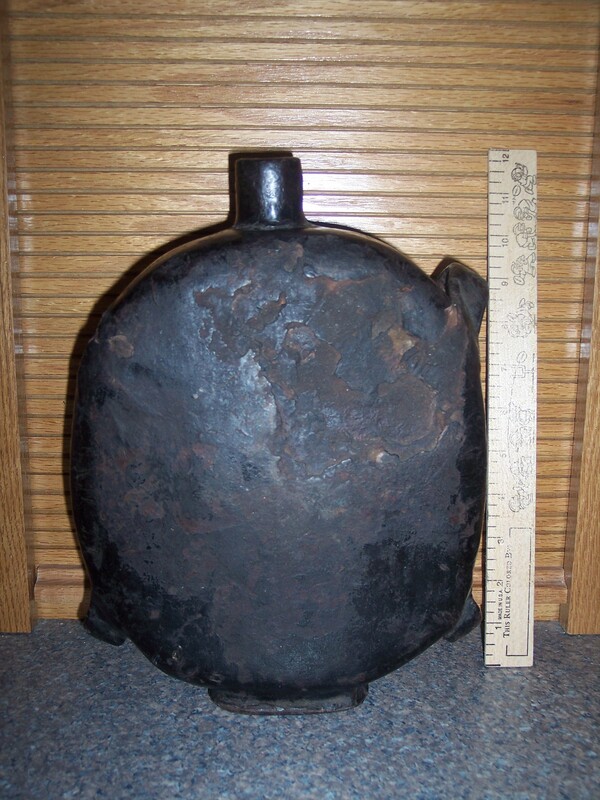 Height is about 250mm, it’s late seventeenth century although the shapes all hung around for hundreds of years.